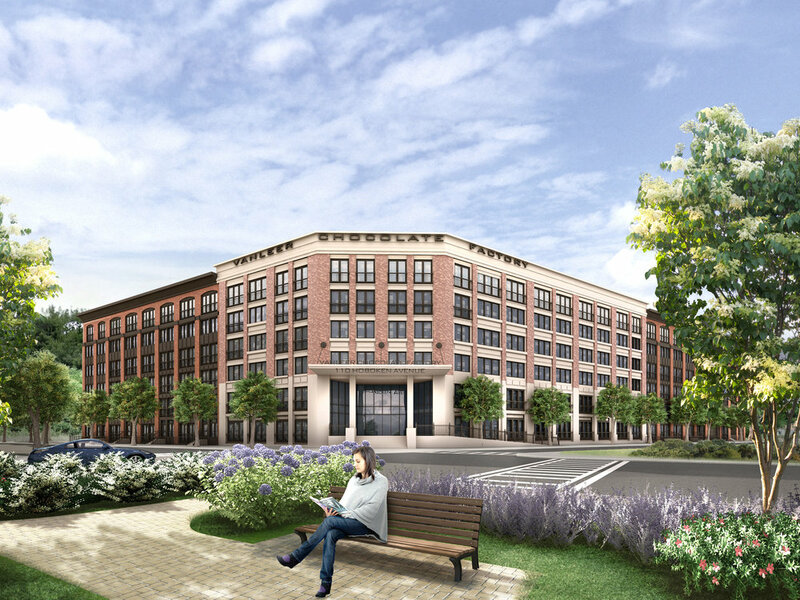 Van Leer Place is an innovative environmentally conscious rental community that will be built on the former Van Leer Chocolate Factory property. It is situated below the Palisade Cliffs on the northern border of Jersey City touching Hoboken and about 1 mile from PATH station. The project is approved for two, six story luxury apartment buildings with 498 apartment units, 3,711 square feet of retail space and a 570 space structured parking garage. Van Leer Place also offers a rooftop garden, public park, and public plaza. Hoboken Brownstone was awarded the Governor's Environmental Excellence Award for transforming the 7-acre brownfield site into a sustainable mixed-use community that leverages energy-efficient and environmentally conscious design. Renderings courtesy of Chester, Ploussas, Lisowsky Partnership LLC.